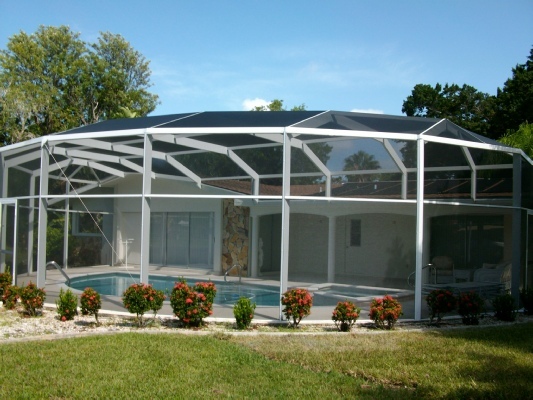 Screened pool enclosures, patio enclosures, patio covers, and screen walls custom designed and built for your tastes and preferences. Our mission is to create a living space protected from insect, rodent, solar and weather elements that integrates into the clients home and family life style. The last window screen you will ever have to buy. The DecA Screen System uses heavy duty extruded aluminum channels and corner keys with Super Screen or other various Solar Screen materials. The frames are stiff, resistant to bending and flexing. Screen materials can provide insect protection and solar protection. Solar Screen materials can reduce interior glare and air conditioning heat loads by factors up to 90%. Frame and screen materials are warranted for 10 years. Spartan Screen products are engineered and designed to me local building department requirements. We will provide you the necessary paper work and drawings to obtain Architectural Committee and Building Department review. Contact us and we will walk you through the process to add value to your house and family life. We use Super Screen exclusively for insect screen in our patio and screen enclosures. Follow this link and learn more about its superior properties, longer life and 10 year manufacturers warranty. We prefer to use Nylo-Tec fasteners in our pool and patio enclosures. They are a premium product designed not to visually deteriorate Spartan Screen will always provide you the option to use Nylo-Tec fasteners. Follow this link to learn more about these very nice fasteners.